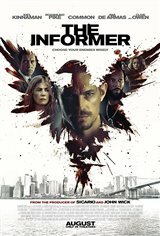 Pete Coslow (Joel Kinnaman), a convicted felon who is working as an informant for the FBI, goes undercover within a state prison to see if he can find evidence of fentanyl being dealt inside. If he finds that evidence, he's been promised he'll be a free man. However, Pete's wife Sofia (Ana de Armas) worries that if he goes back to prison, he'll never get out. Meanwhile, a police detective (Common) is investigating the death of someone close to him. FBI Agent Montgomery (Clive Owen) is concerned that he'll discover an FBI informant was present at the murder, so he orders that Pete be killed inside the prison, against the advice of his colleague, Agent Wilcox (Rosamund Pike), who placed Pete there and promised him his freedom.